Malwina is the latest ripening among the currently available strawberry varieties worth growing. It is going to set new standards for late season varieties in the direct marketing segment. Already under standard cultivating conditions, the peak season is some 22 days after Elsanta (12 days after Florence). When straw covering is applied it ripens as late as about 30 days after Elsanta! Malwina is a crossbred of ‘Sophie’ x a clone from Schimmelpfeng, Weihenstefan. The crossbreeding was done in 1998 by Peter Stoppel, Kressbronn. The plant is very robust and vigorous, with dark green, medium sized, glossy leaves. Malwina blooms under the foliage and is self-pollinating. marketing), their flavour is good – and excellent when picked fully ripe. Malwina is a pleasure to the eye, in the basket as well as in the punnet. Its aroma reminds us of “straw-berries from grandma’s garden”, as a customer put it. Yields for Malwina are about 10 – 15% lower than that of Elsanta (and about 20% lower when straw covering is applied). The percentage of large fruits is 85% (about 77% with straw covering). 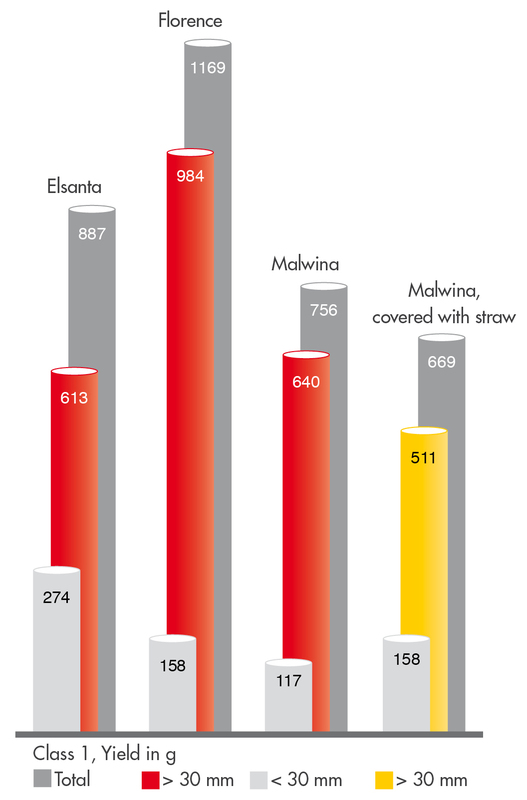 That means the proportion of marketable Class 1 fruits is higher than with Elsanta. The picking rate is between 10 and 15% lower, though, due to the short pedicels and the ample foliage. About 3% of the fruits feature so called “leaved inflorescences”. The genetic defect behind causes small leaves emerging from the fruits on about one fruit per plant. Malwina is very hardy and resistant to diseases. For example, it is tolerant to Verticillium, very little susceptible to fruit rot. Malwina withstands intense rain and is little susceptible to sunburn. Very important is a special spraying program against thrips and strawberry blossom!